SPINELESS: Jim Harbaugh Apologized to Muslim Jew-Haters Over This Tweet . . . Previously on this site, I praised Harbaugh for tweeting in support of the showing of “American Sniper” on campus and in opposition of extremist Muslim students who tried to censor and stop the showing of the film. Well, I revoke my praise. He’s the same wimp and spineless fraud I saw when we were both students at Michigan (which is why I said I am not normally a Harbaugh fan). Yesterday, Harbaugh held a “secret” Apology Tour meeting with the most extremist Muslim student “leaders” on the university’s Ann Arbor campus. The same Muslim students who tried to stop the showing of “American Sniper” because the movie offends them. The same Muslim students who openly support HAMAS, Hezbollah, Islamic Jihad, and assorted other Islamic terrorist groups that murder Americans, Christians, and Jews. Harbaugh has a new title–Chief University of Michigan Dhimmi. When I say the Harbaugh Dhimmi Apology Tour was “secret,” that’s because, while the meeting was publicized, Harbaugh and University officials refused to allow anyone into the meeting other than the Muslim extremist grievance theater cast. Third parties were forced to leave the room. No press were allowed into the meeting. No non-Muslim students were allowed into the meeting either, which could be grounds for a civil rights lawsuit, frankly. And Harbaugh and University officials at the meeting refused to say what went on in the 90 minute confab with 24 Muslim extremists-in-chief. Mekkaoui, by the way, heads an organization called SAFE, which supports the boycott of Israel and held the University of Michigan Divestment Conference in 2002, at which convicted Islamic Jihad terrorist and chief Sami Al-Arian was the keynote speaker. (I was the attorney for Michigan students trying to stop the conference from happening.) At the Divestment Conference, participants shouted in unison, “Annihilate the Jews! Annihilate the Jews!” Yes, ladies and gentleman, you, too, can have a head football coach who apologizes to Nazis bent on genocide. But you don’t see Harbaugh having a meeting with the students who are victims of his new Muslim pals to talk about how to “impact campus climate” when terrorists are hosted and “Annihilate the Jews!” is shouted. Harbaugh probably doesn’t want anyone to know what else was promised to Muslims at this meeting. Did he pledge to allow HAMAS CAIR to conduct sensitivity training on his football team? Did he pledge free tickets to the game? Did he promise to make appearances at area mosques? Or to give money to Muslim zakat (charity, often going to jihadist activity)? You can bet that more than an apology happened at grovel-fest that went on for 90 minutes between Harbaugh and Muslim perpetual whiners. The next time I hear someone from my alma mater shout, “Go Blue!” I’ll think the person has the wrong color in mind. Michigan Football’s slogan should be “Go Green.” Not because it’s rival Michigan State’s color (although now I’m thinking of rooting for the enemy, since the Michigan coach has already given in to the West’s real enemy). But because green is the official color of the religion that just successfully waged jihad against Jim Harbaugh and got him to give in like a French surrender monkey. Jim Harbaugh’s built a reputation as a tough guy and a warrior coach. But he is neither of these things. He’s just your typical wimp who folds the minute trouble shows up, in this case, Muslims who support jihad and hate Americans who do a thing to challenge it. 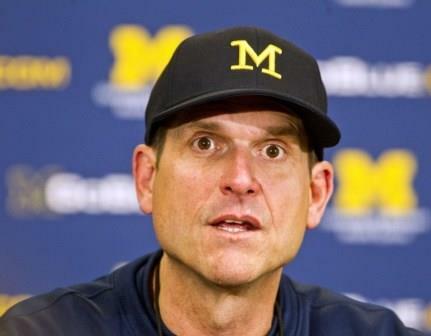 EXIT QUESTION: How long until Jim Harbaugh reverts and changes his name to “Mohammed”? EXIT QUESTION #2: Will NFL jock-sniffer Rush Limbaugh, who praised Harbaugh for his tweet on “American Sniper,” point out that Harbaugh is now apologizing over it to extremist Muslims? Or will he remain silent and ignore the story? Betcha it’s the latter. Somebody, please send me a photoshopped pic of Jim Harbaugh in a keffiyeh. Jim Harbaugh could have easily said no, when University of Michigan officials asked him to cave to Muslims. He would have been in no danger of losing his job, if he just said, “F-ck no, I’m not meeting with ’em.” He is a popular football coach who just signed a new contract and hasn’t yet coached a single game of a single season for Michigan. He is being paid multi-millions pursuant to a multi-year agreement. Twenty-four Muslim students or even the piddling 200 who signed the petition against “American Sniper” being shown on campus could do nothing to affect his job. And, yet, despite having the juice–in fact, more justice than just about anyone–to say no to the meeting and apology/surrender-fest, Jim Harbaugh gave in. He showed his testicles were long ago severed and checked at the door of the halal supermarket of anti-Western ideas. He also agreed to refrain from calling a football a “pigskin”! It is chilling to hear about the capitulations to Muslims that is taking place at U of M. The similarities to the Austrian and German universities of the twenties and early thirties are striking. In Europe, the Nazis had free rein of many universities during that time, and committed acts of terror against opposing students and professors with, in many cases, virtual impunity. We know where that led, but, it appears that anything we learned from that experience has been forgotten. It is too bad that the Holocaust studies that are now so common do not dwell on the similarities between pre-Hitler Germany and Austria and what is now going on in the United States. What a wimp. His football players are supposed to respect this faux tough guy? This guy should have said, “hell no.” He caved like a girlie-man. How sad for Michigan. If libs can destroy a country they can destroy a little sport like football no problem. Anyway, this is probably not about being intimidated this is about Jim feeling like he’s on the right side of history. If you’re going to surrender then it’s best to go all the way. This growing situation of appeasement – regardless of to whom – poses disconcerting questions about the University’s future as well as this country’s future. 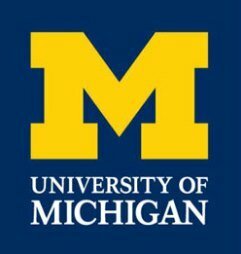 Below, I have listed LINKS to historical information that, in my opinion, will lead to a more complete understanding of how the University’s pressure on Harbaugh, the closed door meeting, the unprecedented demands of Muslim students, and the appearance of dhimmitude by certain factions and players will eventually lead to Western Civilization’s demise – no, not a joke. REALITY: WESTERN CIVILIZATION IS IN A WAR OF IDEAS, CULTURES, RELIGION and/or ABSENCE THEREOF and THE INDIVIDUAL’S RIGHT TO EXIST FREE OF COERCION. It appears Michigan caved, Harbaugh caved, and this event will be the first of many camels pushing noses into the tent. “AMERICAN SNIPER” – was it all in vain??? What a shame that he buckled. I was so happy when I found out that he was coming back to MI to finally “fix” this screwed up football program. I hope he gets them winning again but I definitely lost some respect for him. 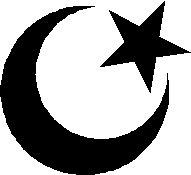 I HATE MUSLIMS!!!!! Based on that last sentence, it makes you no better than the actual people we’re doing battle with. Well I hate rapists, murderers and pedophiles. Does that make me no better than them too? Why would anyone “do battle” with people the love or respect or respect the people they do battle with? New meaning of the term “end run”. He sounds like craven garbage. I’ve always despised the Harbaugh bros. and now I finally have a rational reason. I doubt Coach cares about any of this. In fact I’m 100% sure he doesn’t. This man as all college especially top tier coaches such SD Jim, could give a rats behind about this. Only thing on his mind is football. The school asked/made him and he complied. If any of us interviewed him today, he’d be like, “huh,what,excuse me,come again” give him a pass people, he has recruiting on his mind. The Shadow is right, Go Yellow, like the stripe down his back. Please note: THE MICHIGAN DAILY, May 23, 2015, has an article re this meeting Harbaugh had to attend. The Summer Editor in Chief is LAURA SCHINAGLE. The paper’s CONTACT INFORMATION is readily available. I wonder just how FREEDOM OF SPEECH they are when the GENERAL PUBLIC voices opinions and concerns against the group that DEMANDED this forced meeting because it, this group, was offended, feigned fear, and cried wolf? HARBAUGH, WRITE A REBUTTAL / POSITION PIECE ASAP! I am certain there are numerous colleges that would hire you instantly. Harbaugh isn’t the only gutless one out there, who folds like a cheap fan under the slightest presur; he’s just one of many, unfortunately. Think Robert Gates and his capitulation on the Boy Scouts’ policy of not allowing openly gay scoutmasters, thus placing young boys who are Scout members at risk. I always say, if they cave to the homosexual mafia on the one hand, they’ll certainly and easily appease Muslim groups’ demands for Sharia &c. on the other. One group always smells weakness on our part and correctly figures if they capitulate on one issue, they’ll certainly do so on the other. I meant “slightest pressure.” How it came out as it did, I’ll never know. Jim Harbaugh is just a precursor of what everyone will be forced to do if they don’t wake up. Apologising and bending over to Muslims. Stop apologising. You don’t want us to end up like Europe stuck with its 20 million Muslims, and in a perpetual state of bowing and apologising to Muslims. Debbie, will you date a Muslim? If so, let me know. I am free anytime you HPOA! Get your facts straight Debbie!! He did not apologize you hater! It took me literally 2 minutes of my own research to discredit your entire article! You are a faux writer with your own agenda. Bleacher Report, Washington Post, etc..
1) Harbaugh is stupid enough and/or compromised by PC MC enough to be unreasonably afraid of what the Muslims on campus think of him — even though in reality, they have no power over him. 2) Schlussel is mistaken about how powerless the Muslims were/are in this regard.